Just the other day, I walked through my front door, thinking about church stuff, when the question “What is God?” randomly popped into my head. Without any effort or hesitation, my mind rattled off: God is a Spirit, infinite, eternal and unchangeable in His being, wisdom, power, holiness, justice, goodness and truth. Don’t be too impressed, though. Of the 107 questions and answers in the Westminster Shorter Catechism, I think I can only recite two—that one and the famous first question (Q: What is the chief end of man? A: Man’s chief end is to glorify God, and to enjoy him forever.). Although my memory can’t capture the entire catechism, my automatic mental response is proof that catechisms unite two important things: clarity and memorability. 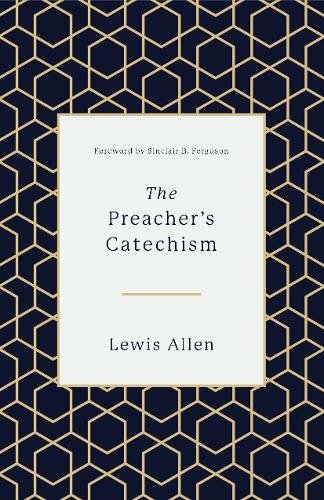 Lewis Allen, in his new book, The Preacher’s Catechism (Crossway 2018), seeks to capitalize on the doctrinal clarity of catechisms and their memorability. Allen also focuses on a third element that he believes catechisms offer: the ability to probe the heart. He writes, “The Westminster Shorter Catechism is an outstanding resource for the heart needs of every preacher” (p. 21). I might not have believed that sentence when I first read it, but now I’m a believer. The Preacher’s Catechism has 43 mini-chapters, each beginning with a reprise of a question from the Westminster Shorter Catechism that aims to edify both preaching and the preacher himself. A good example of this tailoring is in the first chapter. “What is the chief end in preaching?” he asks. “God’s chief end in preaching is to glorify His name,” he answers. Allen is a gifted writer and a church pastor in England. I appreciated his occasional clever tweaking of a familiar Bible passage. On page 31, he writes, “God loves a cheerful preacher.” And when discussing the struggles associated with retirement from the preaching vocation, he reminds us, “Naked [we] came to preaching, and naked [we leave] it. Blessed be the name of the Lord” (p. 105). . . .
* This Review was originally published by the Evangelical Free Church of America. To read the rest of the review, click here.